Hello, all my good friends – it’s Andy Gesner and the staff from HIP Video Promo, and it’s been great to see so many of you recently. I have a question for you: what do you think about when you think of Plain White T’s? Comfort, perhaps; warmth, a certain familiarity, utility, user-friendliness? Something that transcends fashion – an article that never goes out of style? Something crisp, clean, well-defined, attractive? The Chicago-based Plain White T’s – a power-pop quintet with punk rock energy – are an appropriately-named act. Their music is immediately familiar, indelible, timeless, stylish, and comfortable. While their first album (2002’s underrated Stop) was a somewhat unpolished basement rock collection, All That We Needed, their sophomore effort for Fearless Records, presents the Plain White T’s as a well-calibrated songwriting and recording machine. It’ll surprise nobody who’s heard the band that they’ve done shows in support of Jimmy Eat World and Saves The Day – bands they frequently resemble. They’ve recently embarked on an even bigger tour: several weeks out on the road with kindred spirits Sugarcult, Head Automatica, and Hawthorne Heights. Here’s a young group ready for the big time. “Take Me Away” sounds like the springtime rocker of ’05: this year’s version of “Swing Swing”, or at least an instant O.C.classic. It’s got the soaring chorus, the pure and classic melody, the big backbeat and crunchy guitars, and those sweet, sweet backing vocals that drive the kids delirious. Singer Tom Higgenson gives it everything he’s got, spinning out a story of resentment and confusion after getting jilted by his girl. “Now I’m stuck here watching her/I can’t take the abuse,” he calls out to his bandmates – encountering his ex on the arm of her new boyfriend has him on the verge of a complete meltdown. Jay Martin’s splashy video for “Take Me Away” subtly emphasizes the group’s deep roots in classic power-pop. It’s an early-Eighties period piece, complete with the requisite posters on the walls, pastels and day-glo clothing, plush wall-to-wall carpeting, and Colecovision. The band plays in a suburban den ripped from the pages of a 1985 issue of Better Homes And Gardens. Set up against the rear wall, the Plain White T’s spin their sugar-coated story of heartbreak to a slumber party filled with potential girlfriends. They’re stylish and energetic, for sure, but also a little geeky, awkward, anxious to connect. In an Eighties-throwback clip, there are two things you can be sure of – representations of primitive technology, and revealingly-clothed girls in period dress. Martin and the Plain White T’s do not disappoint. The girls in the rec room wear short shorts and bend over suggestively; they lounge on each other, or lay face-down on the rug. When they’re not relaxing on the sofa, they’re doing comparably adorable things – blowing bubbles, manipulating their (ahem) joysticks, teasing a cat with a string. The clip opens to the satisfying click of a young woman sliding a cartridge into an antique entertainment system, and ends with the requisite “Game Over” sign. It’s great to be working, once again, with Adam LaRue and the great gang at Fearless Records once more. They’ll be providing us with a stash of Plain White T’s discs for giveaways. The band will be on tour with Midtown and Action Action this spring and on the Warped Tour this summer, so if you want a video interview or video ID, let us know. If you need more info call Andy Gesner at 732-613-1779, or email info@HIPVideoPromo.com . 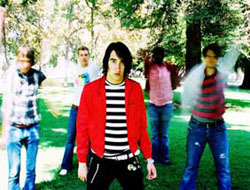 You can also visit www.PlainWhiteTs.com, orwww.FearlessRecords.com to find out more about the Plain White T’s.